A team of researchers from the University of Exeter and Fera Science Ltd, both in the U.K. has found evidence that implicates the insecticide fipronil as the culprit behind a massive die-off of honeybees in France in the 1990s. In their paper published in Proceedings of the National Academy of Sciences, the group describes their study of two insecticides that were thought to be behind the die-offs and what they found. France experienced a serious die-off of honeybees over the years 1994 to 1998. The die-off, which was tied to colony collapse, began shortly after farmers began using two insecticides: imidacloprid and fipronil. Many farmers and some environmentalists blamed imidacloprid, but it was never proven to be the cause. Farmers stopped using both of the products and the die-offs stopped. 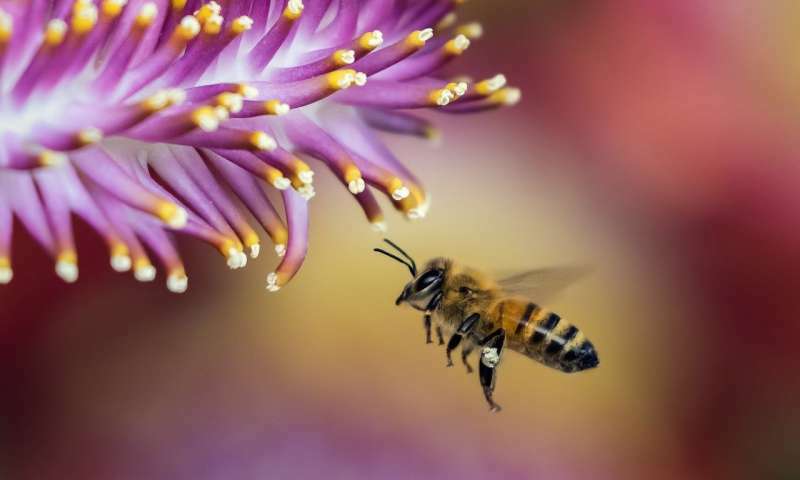 In this new effort, the researchers have reviewed the die-off and report evidence that fipronil, not imidacloprid, actually caused the honeybee colony collapse and the subsequent die-off. To learn more about what actually happened, the researchers conducted mortality rate tests of the insecticides on honeybees in their lab and then set up simulations designed to show how the insecticides impacted the honeybees in the wild. The researchers report their simulations showed 4,000 to 9,000 more deaths compared to a control group over just the first week of exposure during testing of fipronil—colony collapse followed shortly thereafter. They also report that they ran a similar test with imidacloprid and it showed far fewer deaths and no colony collapse. The researchers also report that fipronil tended to bioaccumulate in the bodies of the bees while imidacloprid did not. Thus, prolonged or repeated exposure to fipronil was far more lethal. They suggest testing the impact of chemicals introduced into the environment for both mortality and bioaccumulation. They note further that because fipronil was never fingered as the cause of the die-off in France, insecticide makers around the world continue to use it to kill a variety of pests, likely putting bee populations at risk. Although fipronil is banned by the E.U., seeds treated with fipronil can still be sold across the continent.